This section is dedicated to a study of the particulars of sled history. It is a work in progress. Sleds originally were an important transportation tool that facilitated the movement of goods and people on frozen surfaces where wheels often did not work. Early petitions were made to the British to allow sliding on Beacon Hill. Later, sleds were used to transport heavy cannon in the early years of the Revolution to oust the British from Boston. Pastime and other early cutters used prints depicting people in Victorian style clothing with the children appearing very "grown-up". Such prints including the one pictured made wonderful puzzles of an era we longingly look back at over 100 years ago. 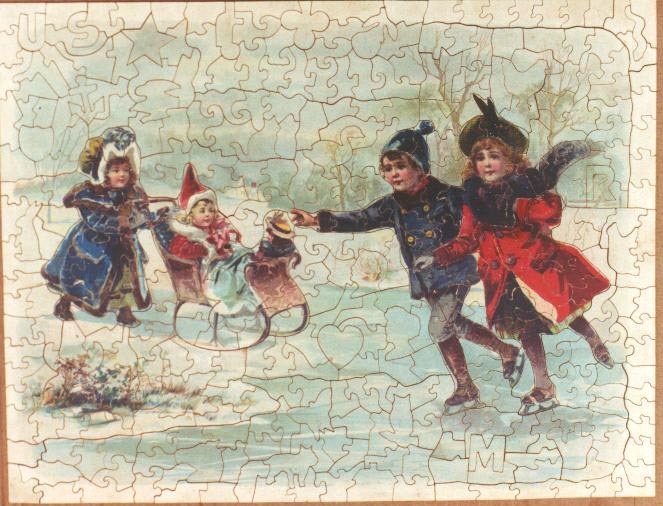 Puzzle shown has extensive color line cutting and 35 figure pieces and was cut around 1917.